Diamond Garden Care works all year round and in all weathers - for us gardening is not just a fair-weather occupation, we know that there are plenty of jobs that need to be done. Whether you want a general tidy up of your garden in preparation for winter or need a fence replacing during the bleak early months of the year, we are ready and willing to do whatever is needed in your garden. One of the most common seasonal jobs we do is leaf clearing. Once the leaves start to fall in the Autumn it's an ongoing battle to clear them. Left to decay on your lawn, the grass will suffer and moss is likely to grow - a huge shame if you've been carefully tending your lawn through the summer months. We'll also remove leaves from ponds, paths and driveways, anywhere they are collecting and making your property look untidy. Diamond Garden Care will come in and remove fallen leaves as part of your regular garden maintenance schedule or as a special visit if we don't usually look after your garden. Leaves are great for composting; we can fill your compost bin or, if you don't have one, put them into bin bags that can be stored in your shed or garage to rot down. If you prefer, we'll add them to your garden waste for collection by your council, or take them away and dispose of them environmentally. Leaves on paths and driveways can leave surfaces very slippery; to ensure that you and your visitors are not at risk of accident, we also offer a power-washing service that can be carried out in conjunction with leaf clearing or as a separate job. Planting bulbs at key times of the year will ensure colour in your garden from spring right through to autumn – it just takes a little planning and organisation. Mulching provides extra nutrients to plants and keeps down the weeds. Applied to beds and borders in the spring months, mulching will trap in moisture from rainfall and help prevent plants from suffering during the hot dry months of summer. Mulching in the autumn will help protect plant roots from frost throughout the winter months. 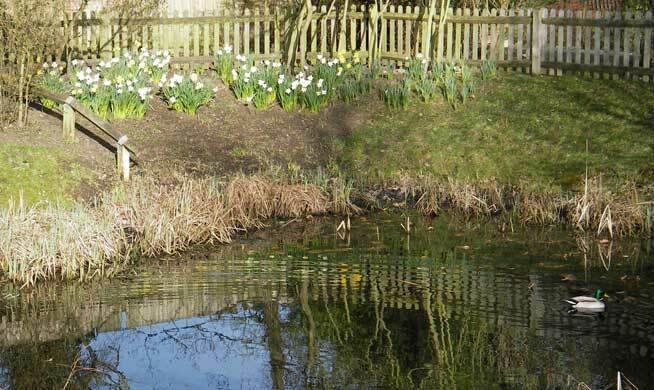 Pond maintenance is easy to forget, but it's important to ensure water features don't become choked with weed – essential to do during the summer! And if it's been snowing, we'll come and clear paths and driveways for easier and safer access. It’s never too cold, wet or windy to call us! Contact your local Diamond Garden Care team and we’ll happily give you a FREE no-obligation quote for all your seasonal jobs.